The prudent choice for dinner should of been a salad after eating 15 different barbeque items for lunch. 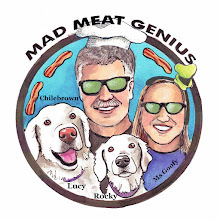 This was not the case for our Mad Meat Genius weekend. We wrapped up our ‘Barbeque 101’ class and needed to get the ‘Hell out of Dodge’. (L.A.) All the stories of traffic and smog are very true. We crawled through a maze of highways and drove four hours to Clovis California. Our destination was ‘QN4U’ a very popular and infamous barbeque restaurant. 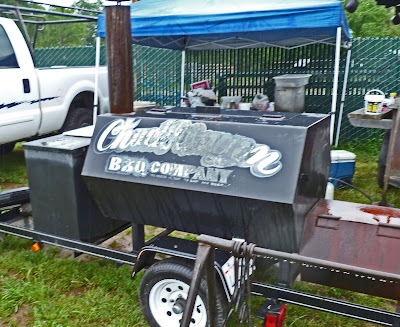 QN4U is the name of the restaurant and also Brent & Kim Walton’s competition barbeque team. 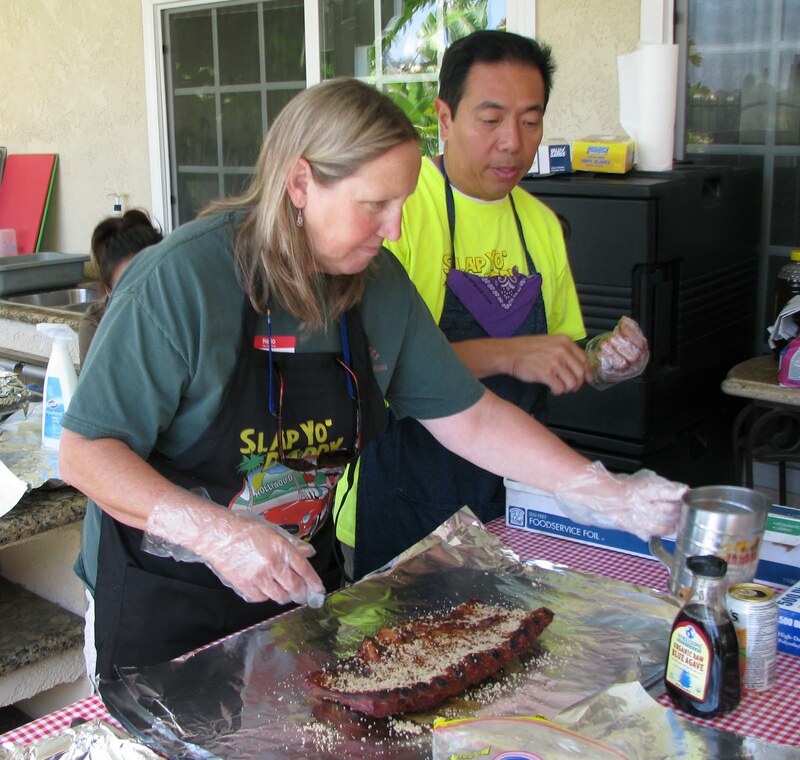 The Walton’s are very successful competing in barbeque contests throughout the country. They have applied their winning formulas to a fun and exciting bbq restaurant. QN4U is a huge barn like building. Walking through the doors will transport you to a western cowboy themed arena. A large mural of an old western town adorns one wall. 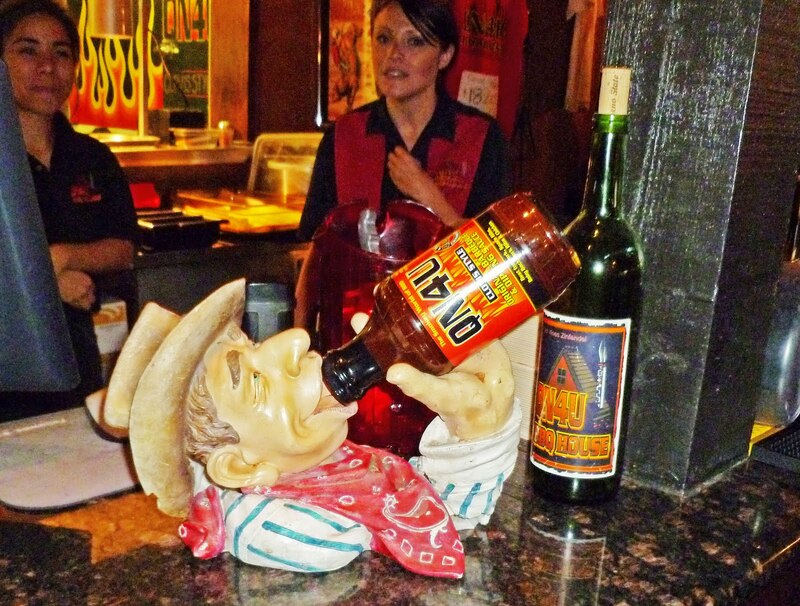 Hundreds of barbeque trophies are proudly displayed on the walls throughout the restaurant. This place just has a fun vibration that suggests the meal to come will be great. The first menu item I noticed was a jalapeno and cheese stuffed hot dog that is bacon wrapped. We were on a mission to try the barbeque this trip. 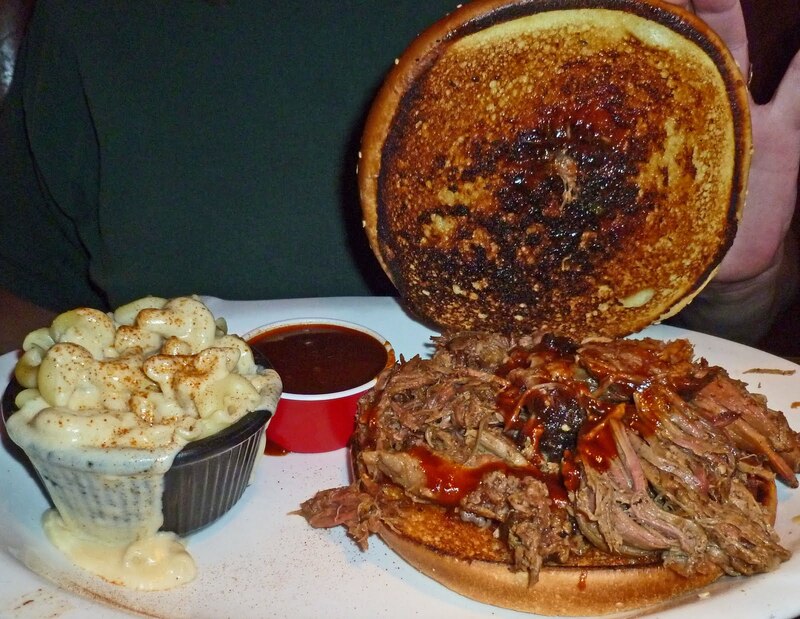 A combination platter of brisket, pork and ribs was my choice and a pulled pork sandwich was Ms. Goofy’s wish. This was a huge platter that took up most of the table. 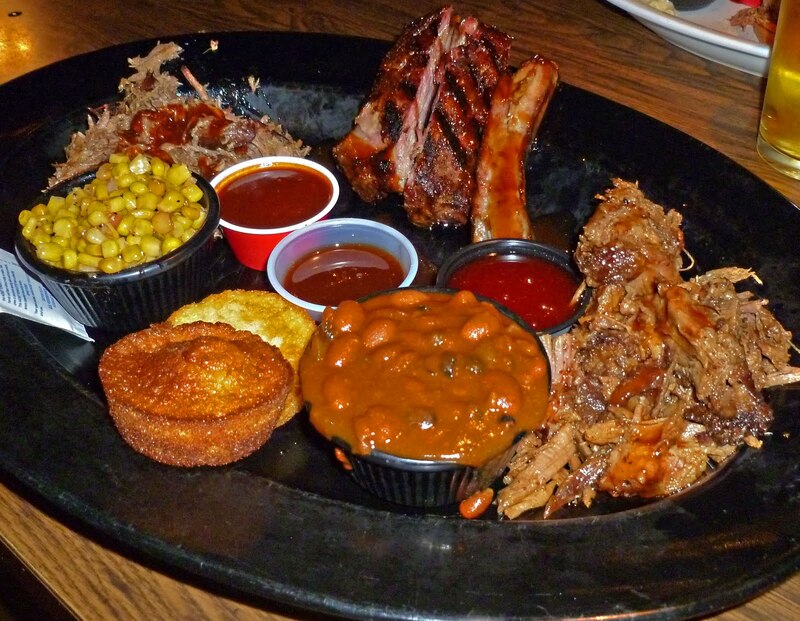 My meat platter was accompanied by three award winning different bbq sauces. The sauce for the pork was sweet tomato based with a hint of smoke which was my favorite. The sauce for the brisket was a little too sweet for my taste. The meats were most excellent. This is barbeque to be proud of. Tender, smoky and most of all you could taste the meat. This meat was not overpowered by seasoning or smoke. The sides were stellar with the beans being a hands down favorite. Little chunks of brisket swam in a soupy pool of beans, molasses, and love. Ms. Goofy did not have a lot of room to eat her delicious pulled pork sandwich. It did not come with Cole slaw but our waitress promptly brought her some slaw. Ms. Goofy thought her sandwich was worth the four hour drive. QN4U is our new destination barbeque restaurant. Unfortunately it is a three hour drive from our abode. QN4U offers barbeque classes and we have already put in our names for the next class. This will be a great reason to return to this ‘BBQ Palace’. I never did mention the piece of best ever pecan pie that was ordered to go and devoured back at the hotel room. Oh my gosh! What a find! “Barbeque class? No kidding? ‘The Mad Meat Genius’ is going back to school for fire pit cooking lessons?” Well, this was no ordinary class. This was a class taught by a very special teacher named Harry Soo. Harry is a multiple, multiple award winning 'Pittmaster and Television Personality'. Harry offers his class when he is not competing on the barbeque circuit. Ms. Goofy and I traveled down to ‘So-Cal’ to partake on this ‘once in a life time’ opportunity to broaden and expand our barbeque knowledge. We started from ‘Hind Quarter One’ for our lessons. Did you know; the left brisket is tenderer because the bovine is right hoofed hence less muscular structure. (Just kidding, maybe) Sauces and rubs was the first chapter. We were sworn to secrecy under the penalty of death and were beholden of Harry’s secret rubs and such. This was a hand’s on class. We all participated in the trimming and seasoning of our particular meats. We learned about different fuels, fires cookers and wood smoking materials. Hints and award winning barbeque techniques peppered our seven hour class. Time flew because this was knowledge that we wanted to absorb. The best part about this class is that we get to eat our lessons. Harry made 15 different items and we ate them all several times. We even took home a goody bag of leftovers. What a day! Harry Soo is a very passionate man. He shared his award winning techniques and recipes. I learned so much!!!!!! Ms. Goofy was so excited and inspired after this class she has given the thumbs up to purchase a second ‘Weber Smoky Mountain’ cooker for dueling smoker purposes. Thanks Harry Soo for the wonderful class and my new WSM to come. We are firing up the Formula-One Racing Honda and driving 410 miles south to Diamond Bar California. 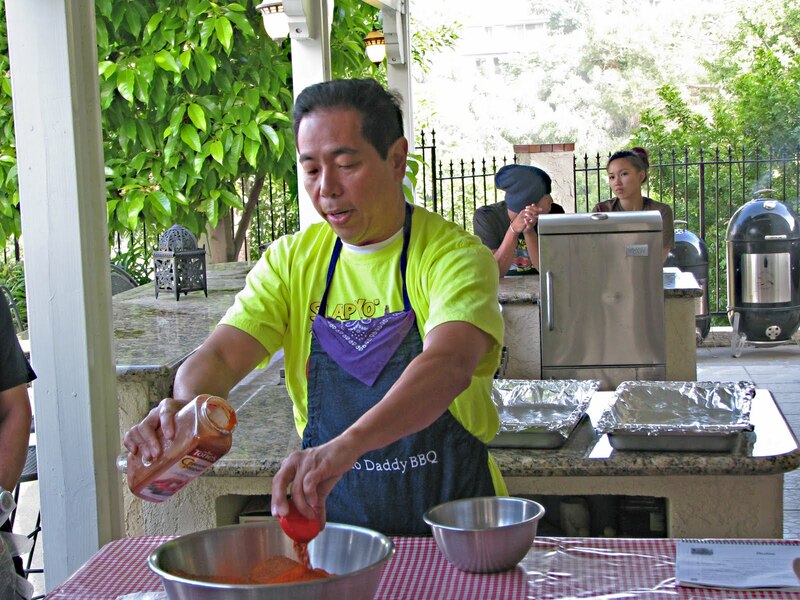 We are on a mission to take a barbeque cooking class from the famous Harry Soo. 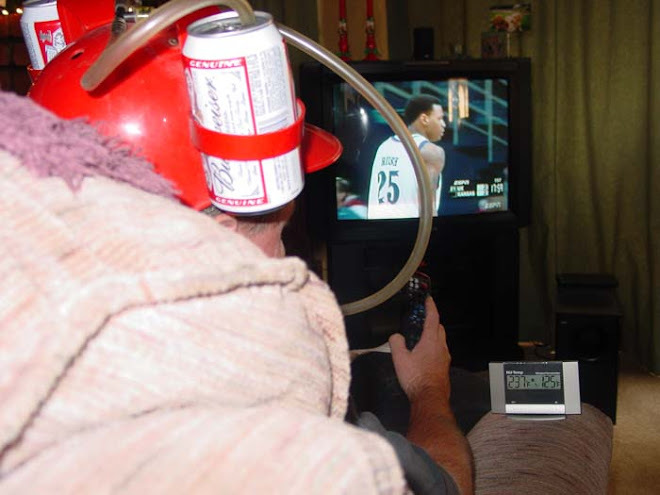 Harry Soo wears many hats. He is a Pittmaster, Father, Grand Champion (multiple times), Television Celebrity, and Barbeque Sensei. We are hoping to learn and experience some of his award winning techniques. This should be a wonderful and fun learning experience. 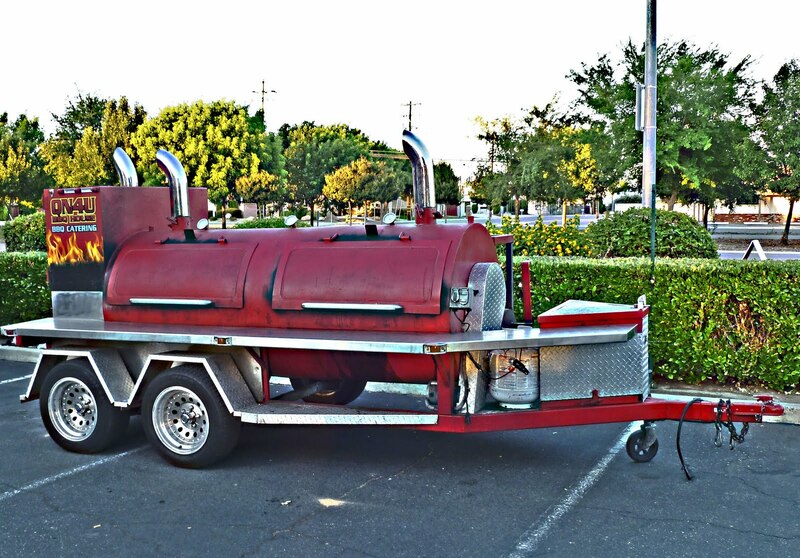 We have a few planned Meat Adventures for the journey down to Southern California. It is going to be a Mad Meat Genius weekend. Talk to you soon! 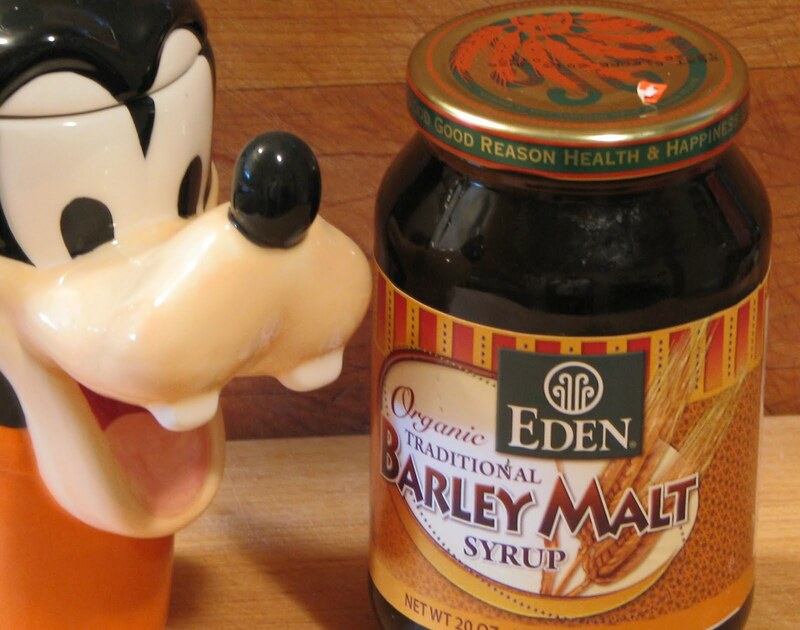 Barley malt syrup is a key ingredient for home brewers and bakers. Alton Brown from the ‘Food Network” swears buy it for pizza dough making. 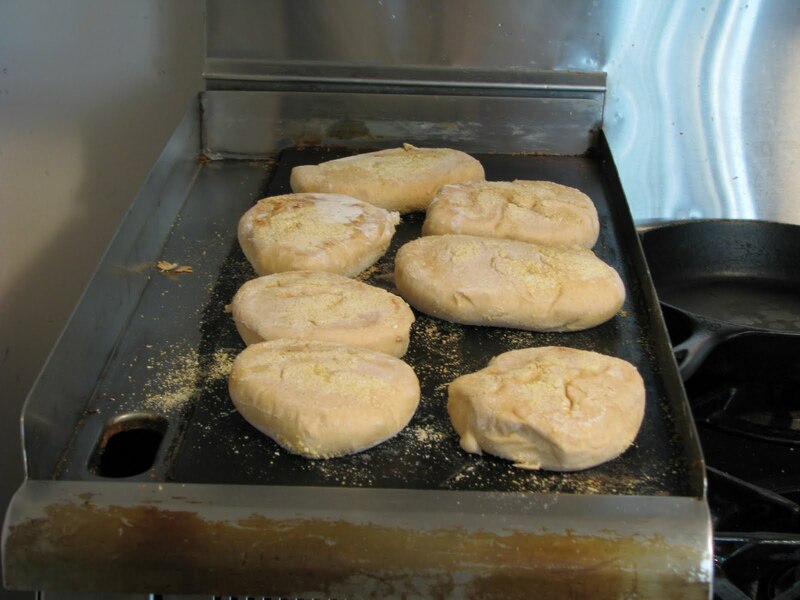 It is a key ingredient for ‘Parker House Rolls’ from the famous ‘Parker House’ in Boston. Barley malt syrup is created from whole grain organic barley. It is sprouted and then heated to create enzymes that convert to starch, with the complex carbohydrate turning to sugars. It is evaporated to create syrup. This thick syrup is half as sweet as white sugar with a molasses/ honey type quality, and a malt flavor that will be great for baked goods. It took some searching to find this nectar of the ‘Food Network Guru’s’. It is not stocked at our local ‘Wally Mart”. Luckily the Bay Area is full of ‘Health Food’ stores and a jar was found. This syrup can be used as substitute for sugar or honey in your baking recipes. I just substituted this syrup in our English muffin and pizza dough list of ingredients. If you liked your baked goods a little sweeter you may have to add additional sweetener according to the syrup label. We will have to give a taste test to check out this advice. 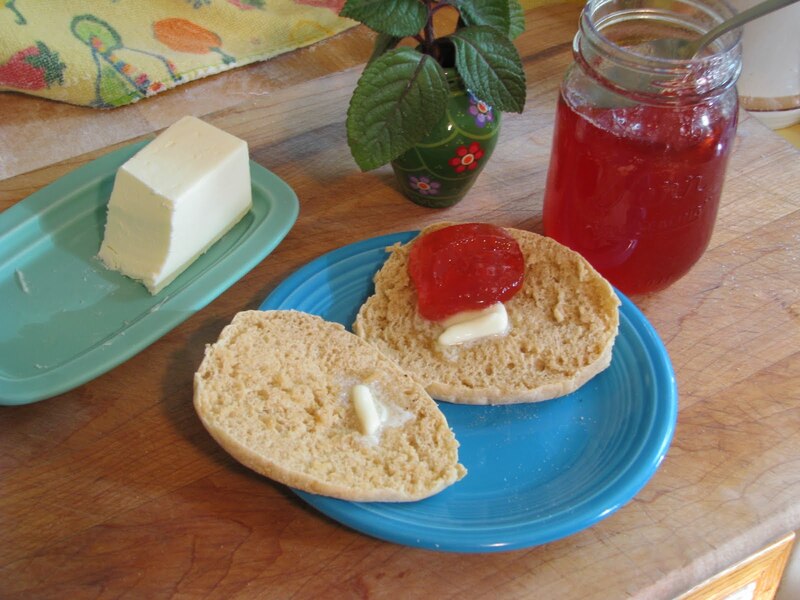 The English muffin and pizza dough really took off with the combination of Barley malt syrup and yeast. They both rose with vigor and stamina. This syrup may have blue pill quality on the baking scene. The English muffins did have a hint of malt flavor. It was very pleasant with subtle malt flavor. 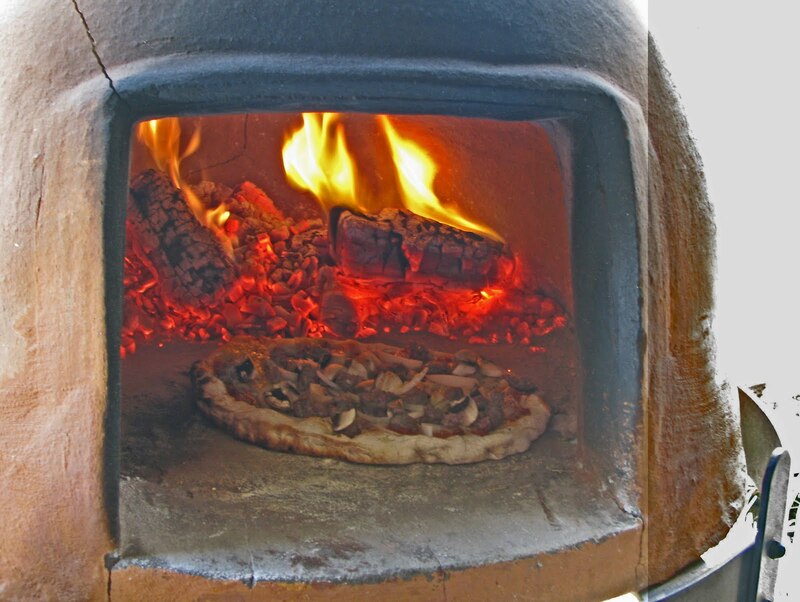 The pizza dough did not have a malt flavor, possibly because it was hidden with the cornucopia of other tasty ingredients. We did not notice any lack of flavor because of the smaller sugar content. If you like to bake, Barley Malt Syrup is a must have ingredient. It will add flavor with less sugars. This thick sweet syrup marries with yeast to form yummy baking delights. I cannot wait to try making some ‘Parker House’ rolls. Landscaper, urban farmer, Cassie and Scott are two city dwellers raising chickens, rabbits, ducks and turkeys on a wonderful urban farm. 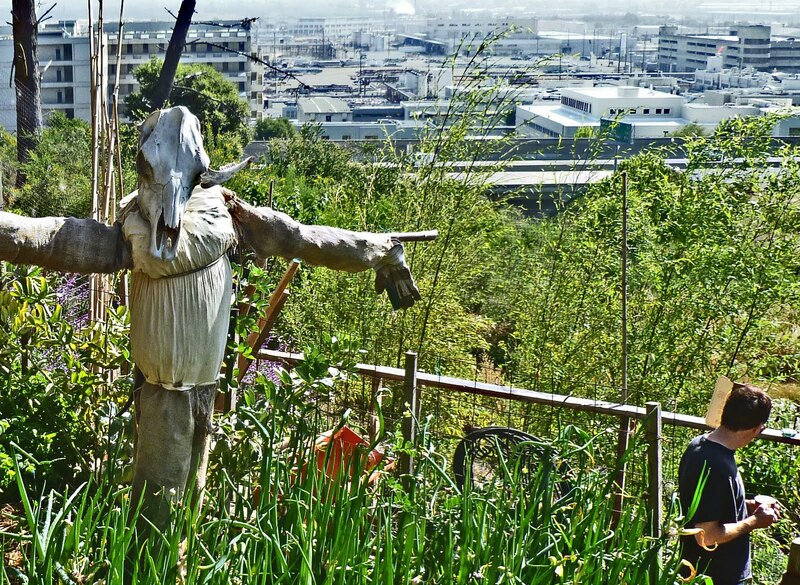 Their farm is located on a hillside tract near the Richmond-San Rafael Bridge. The hillside has been carved into beautifully planted terraces. Every plant you could ever imagine is growing somewhere. Vegetables and flowers organically grown and fertilized from the manure produced by their animals make for healthy and vibrant flora. I was lucky enough to pay them a visit and see their urban farm. Cassie is a vibrant, spunky fireball of energy. She needs to be to feed her brood of animals. Scott is laid back and likes to barbeque. We bonded instantly. We walked around the garden and I was amazed at the sheer number of different plants. You had to be careful because chickens were running around freely. 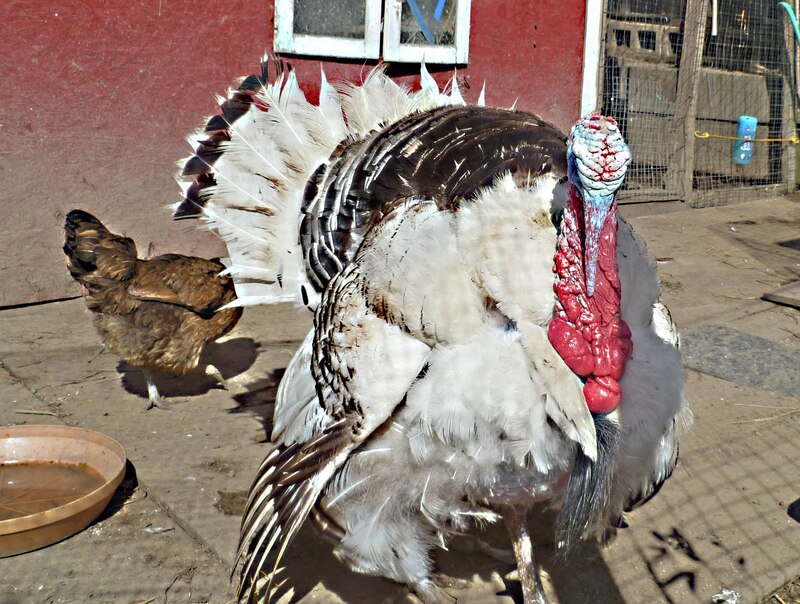 There was also this large tom turkey that was kind of curious and kept his eye on me. This turkey would actually come when called. Could you imagine taking your turkey on a walk? My original purpose of this visit was to purchase some eggs and manure. They had multi colored chicken eggs and some rather large duck eggs. 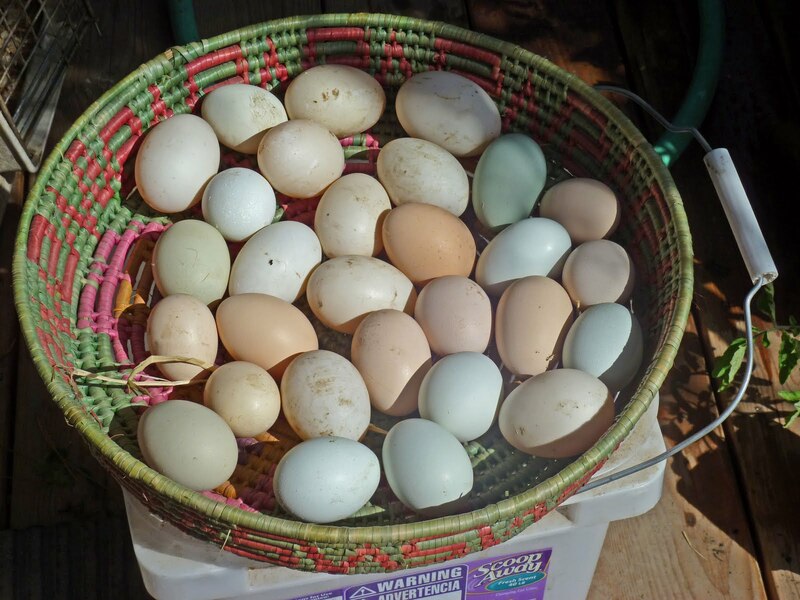 Some of these eggs are fertile and will incubate and hatch. 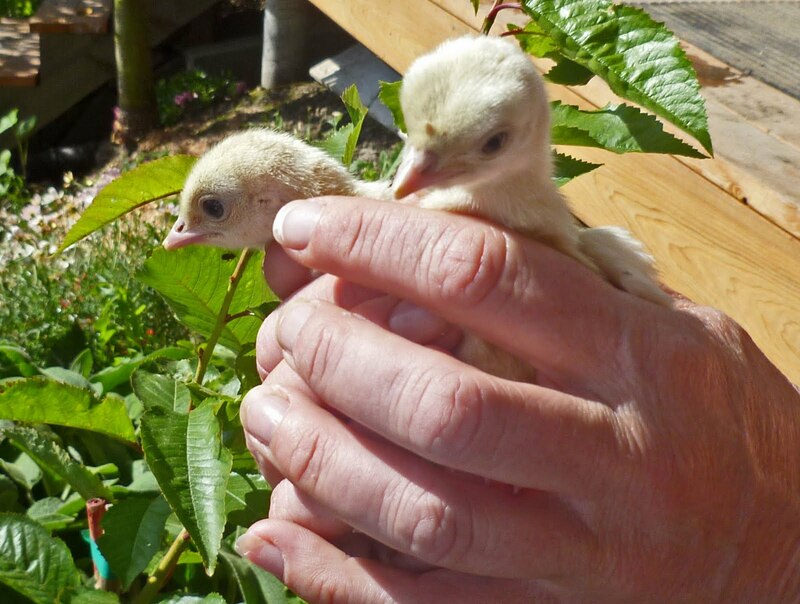 Cassie is holding some baby turkeys in the image. I loaded up the truck with eggs, manure and a couple of plants. Cassie could not talk me into taking home a rabbit. What would Ms. Goofy say if that had happened? It was a wonderful visit to an urban farm. 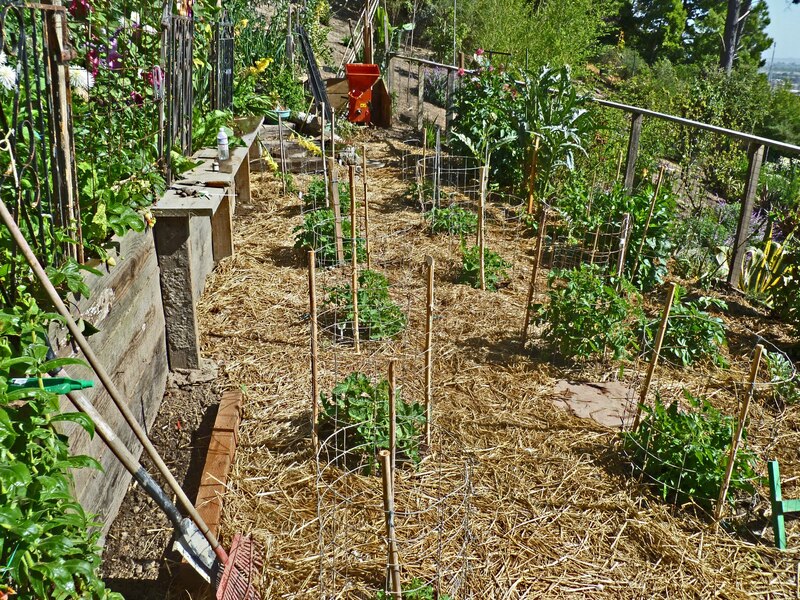 Cassie and Scott have created a beautiful garden oasis on a once neglected slope. 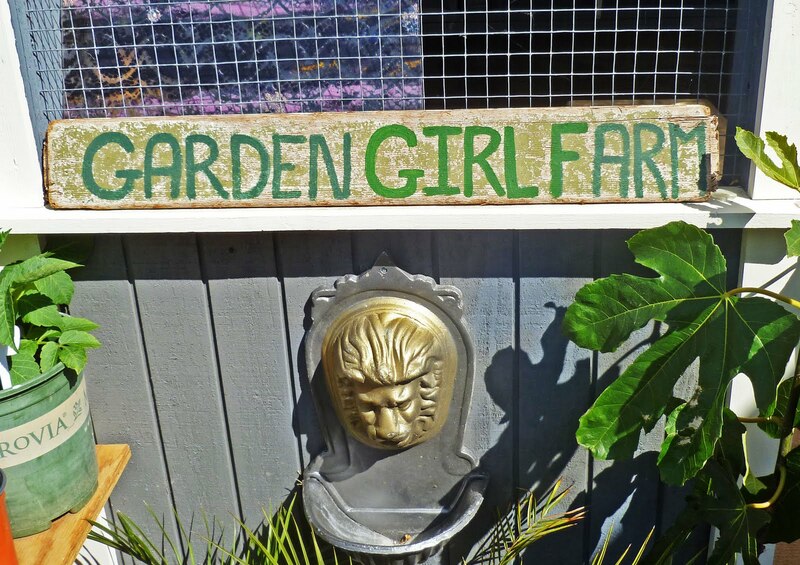 You can read about their adventures on her website Garden Girl Farm. If you are in the East Bay you can purchase food and animals by giving them a call. I am going to cooks some eggs. “And now for something completely different.” Mustard barbeque sauce is on the table today. The West Coast has a preference for sweet tomato based sauces for ribs and chicken. 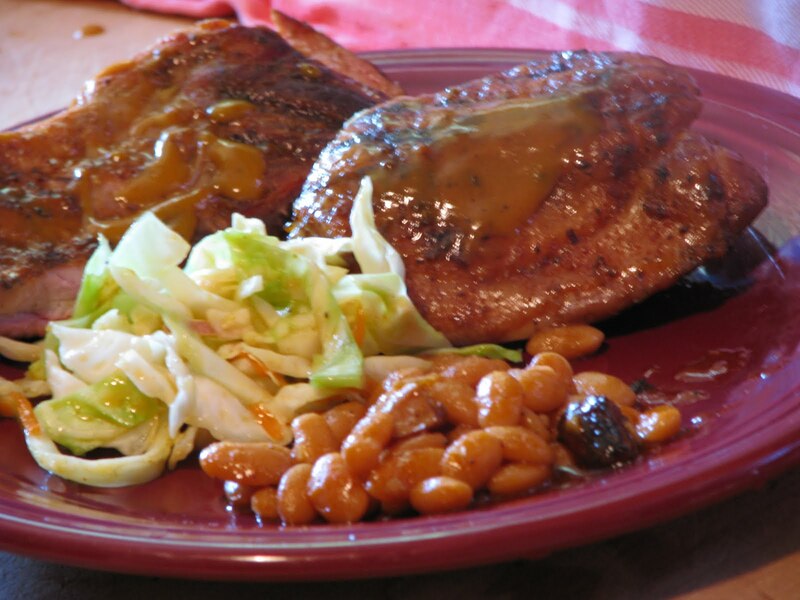 I have seen recipes for South Carolina mustard BBQ sauce and have been curious. 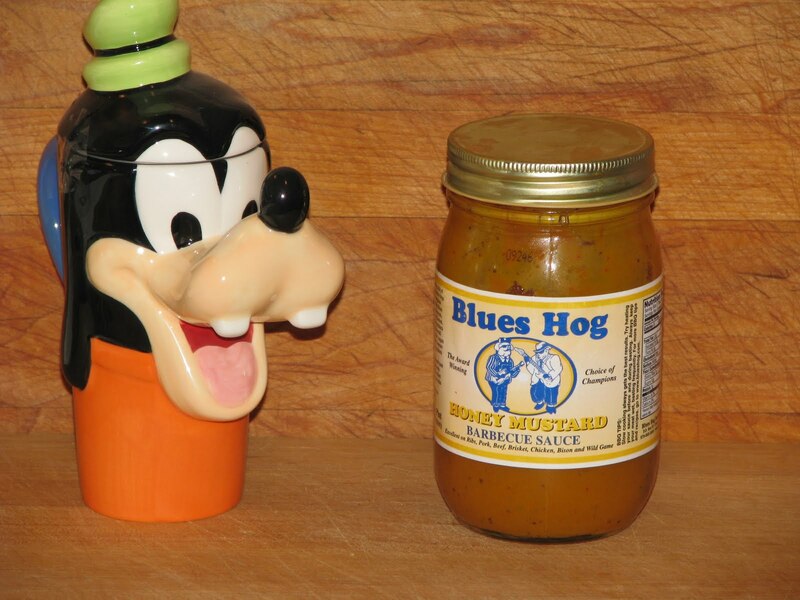 ‘Blues Hog’ originated in Tennessee and now is based in Missouri. Blues Hog regular tomato bbq sauce is spectacular and is worth searching out. We saw this mustard mustard/honey barbeque sauce and said: Why not? Opening the lid vinegar and mustard aromas will grab your attention. A quick dip of the pinky resulted in a sweet molasses/mustard flavor. The real test will be on some chicken and ribs. 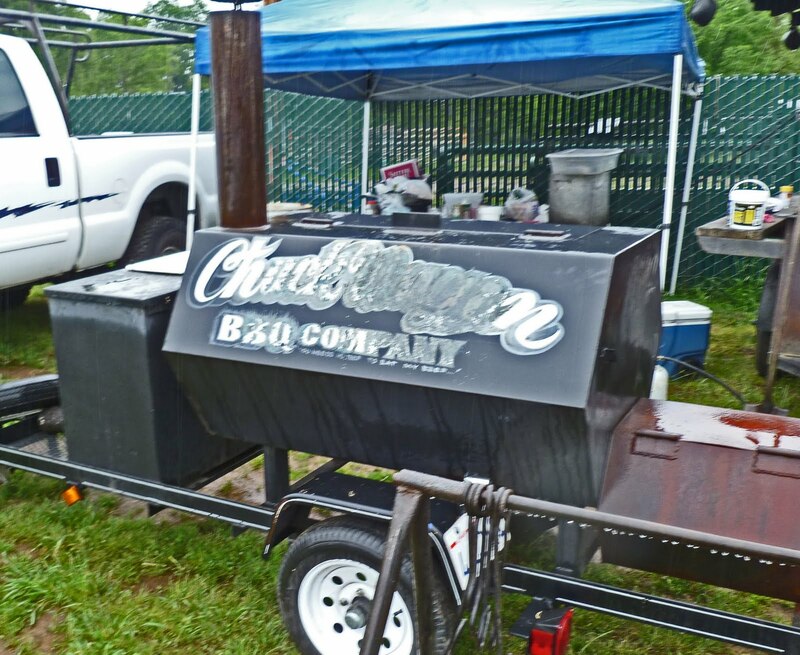 The Weber Smoky Mountain Cooker was brought into service. Today’s fuel was briquettes supplemented with hickory wood chunks. Some chicken and ribs were rubbed in some dry rub and dispatched to the grill. This sweet mustard sauce really shined on the chicken. This was a Ms. Goofy favorite. The twang from the vinegar and mustard was tamed with the honey sweetness. The ribs were a different story. In our opinion this sauce just does not cut it on pork ribs. Maybe it is just our West Coast preference but this experiment was a bust for the ribs. Overall, it is nice having something a little different on our chicken. This sauce is unique and tasty. It sure is fun experimenting. 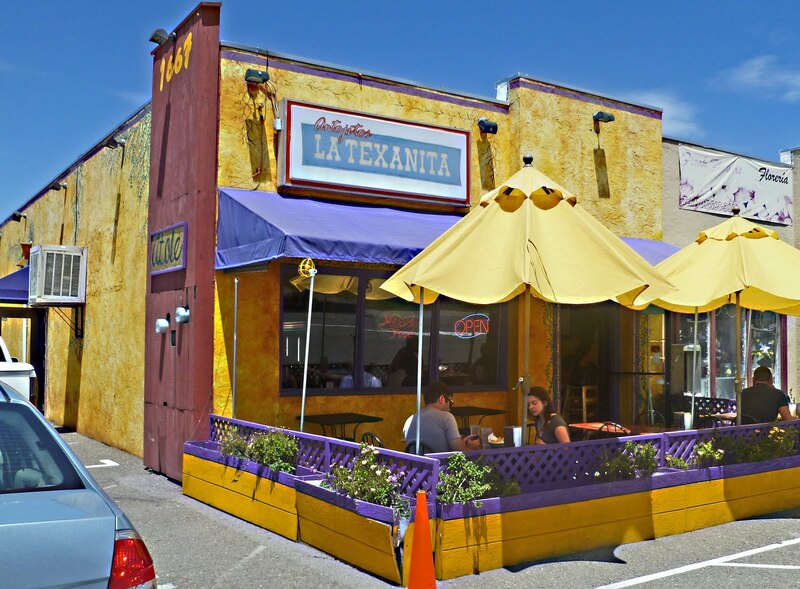 La Texanita is a festive and brightly painted establishment. When you walk through the door a large autographed photo of Guy Fieri will greet you. 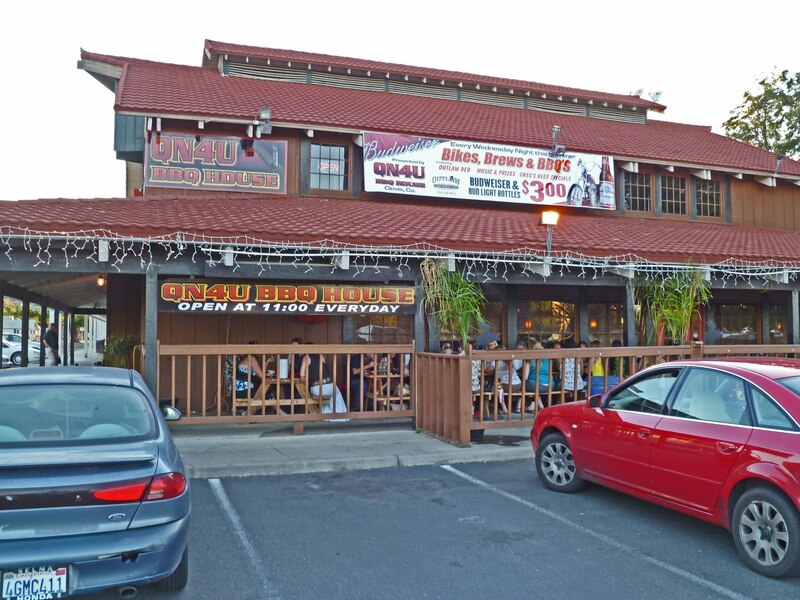 You have a seating choice of about a dozen indoor tables or the outdoor patio. Dr. Biggles and I agree that a quality indicator of the meal to come will be the chips and salsa. These chips came with a refreshing cucumber, lime and avocado salsa and a nondescript bland canned tomato, onion and pepper mix. 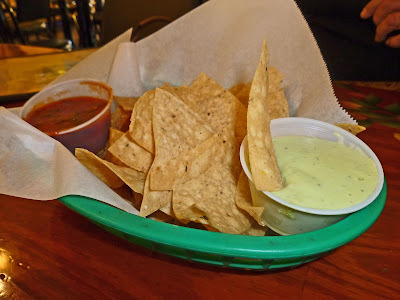 The cucumber salsa was unique and perked our taste buds for the meal to come. The menu was scanned and no Chile Verde was found. The Molcajete dish sounded delicious. 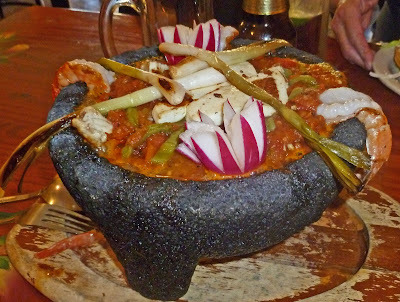 This was a bowl of grilled components; beef, chicken, shrimp, cheese, and onions served with a spicy broth in a carved stone molcajete. Rice, beans and house made tortillas accompanied this dish. This stone cauldron came to our table steaming and bubbling with flavor. The first thing I noticed was the beans were not your ordinary pintos but white beans. At first I was a little skeptical but after a couple of spoonfuls I was hooked. Creamy, smooth, salty and full of lard made these beans very special. The broth of my dish was a very special combination of tomato’s peppers and meat flavor that was superb. The grilled panela cheese did not have a lot of flavor but added a tofu like texture to the mix. 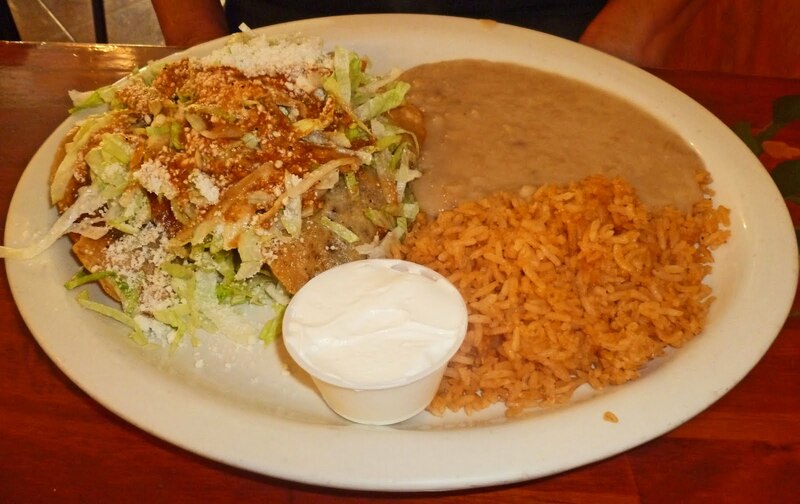 This dish was not spicy hot but the combination of flavors melded together to create a very satisfying dish. Ms. Goofy had the carne asada tacos which were featured on the TV show. These were made with house made tortillas. 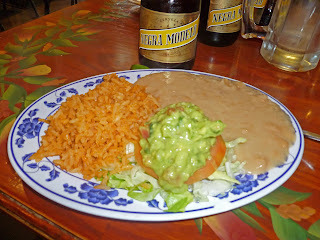 The house made tortillas did not really have the pop and wow that we have experienced in other Mexican restaurants. These tortillas did cradle taco filling that was spectacular. Ms. Goofy was very happy with her plate. We both had very good dishes. It is always fun to visit a “Triple D” food adventure spots. Give it a try sometime. Ms. Goofy and I are getting gosh darn spoiled. 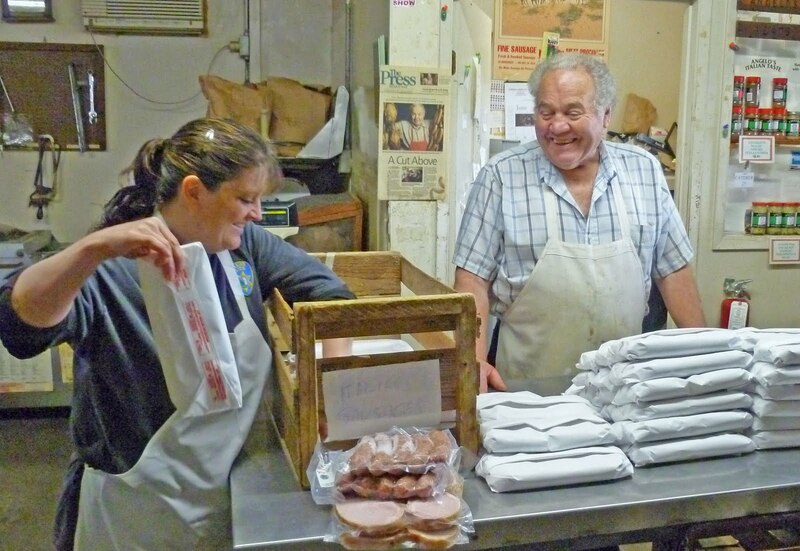 We have been visiting Angelo at “Angelo’s Smokehouse” in Petaluma California to purchase his meat wares and have been fed our last two visits.This is not your ordinary snack or meal but Italian treats that only a passionate and caring cook can create. Angelo today made us some ‘Genovese” risotto. Arborio rice perfumed with onions, garlic, spices and olive oil is simmered with “Italian Gravy” to create a warm and comforting treat. Angelo was pretty guarded with his recipe and secret preparation. All we know is it was pure, comforting joy. We stood around the kitchen and smiled in-between bites. This is one habit forming ritual that we love. After our large and filling snack we went into Angelo’s meat preparation area and watched his assistant wrap some good looking fresh Italian sausage. You know a couple of links were destined for our ice chest. Our goal today was to purchase some breakfast sausage that we have become enamored with from our last visit. It just so happened that Angelo had a new duck breakfast sausage for us to try. We filled up our ice chest with meat treats and settled our bill. As we were leaving, Angelo gave us two salami sandwiches on warm house made foccacia to go. This is my kind of meat market. 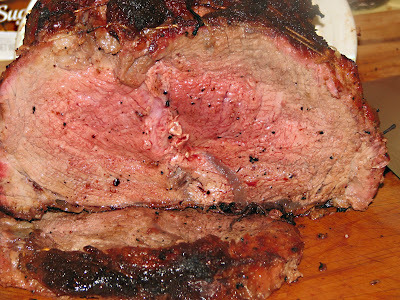 “Cross Rib’ roast, not to be mistaken with the “Standing Rib’ roast, will be cooked on the barbeque fire today. This is an inexpensive cut of beef that if cooked correctly will be tasty and tender. 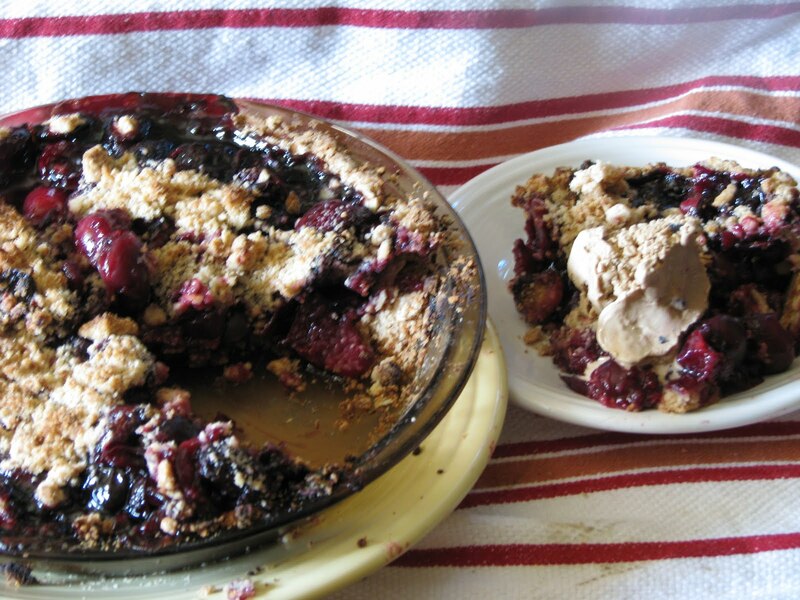 You will need to follow several easy directions to achieve delicious results. Our roast today was procured at our local “Wally Mart” for only several dollars. This is one economical cut of beef. Our roast was rubbed with some spices (rub) and left to marinade for several hours. Here is a not so secret way to cook this roast. Bank 25 lit coals on each side of your barbeque kettle. Place a drip pan in the center in between the coal banks to catch dripping fat. Place a thermometer in center of meat. 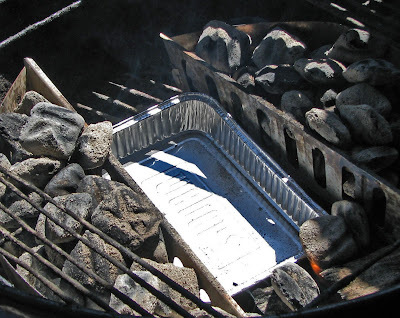 Place the roast on the barbeque grate over the drip pan in between the two banks of coals and put the lid on. This is called indirect cooking. Cook until internal temperature of the roast hits 125 degrees. (It is very important that when you hit this temperature of 125 degrees that you stop, because there will be carry over cooking when you let the roast rest.) This is the hard part. You need to let this roast rest for at least 15 minutes to let all the juices redistribute thoroughly. Slice into thin slabs of meaty delight. 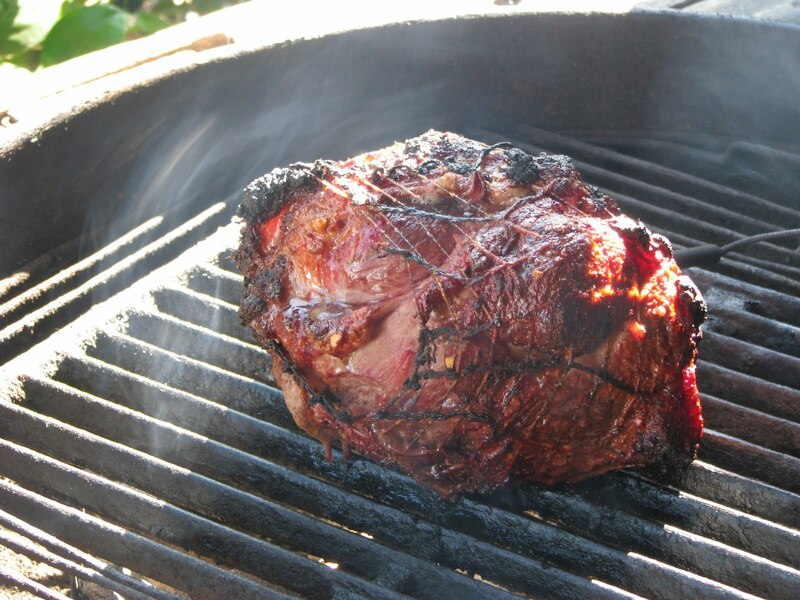 The smoke of the fire adds such a wonderful dimension to beef. Medium rare was the beautiful results of proper cooking. This tender and juicy roast could have been sliced with a butter knife. One of the best things about this meal is the anticipation of sandwiches for the next day. Oh my! Sizzle, sizzle, pop, crackle, fizz, sizzle, can you smell that? Boy, oh boy does it smell good in here. 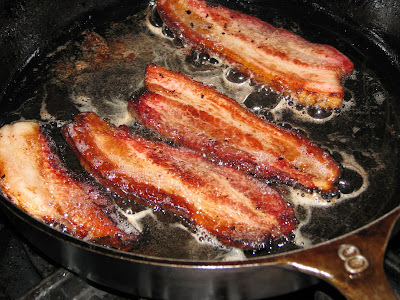 The black iron skillet is frying up some home cured and smoked bacon. This sowbelly was created for my good friend, ‘The Great White Hunter’. 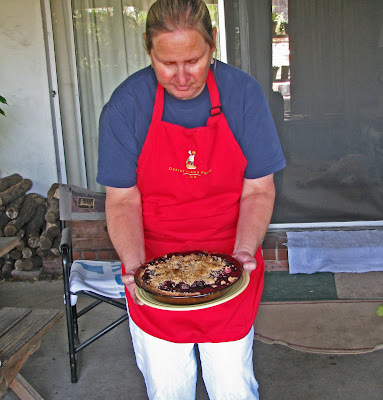 He requested that I use a nitrate free recipe to satisfy his restricted diet. A pork belly was soaked in a brine of salt, sugar, molasses water, and apple cider for three days. 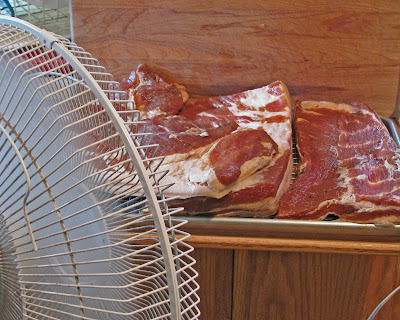 The next step was to dry and form a pellicle on this cured belly to prepare it for smoke. A pellicle is when you prepare the surface of your protein to allow a better acceptance and penetration of smoke. 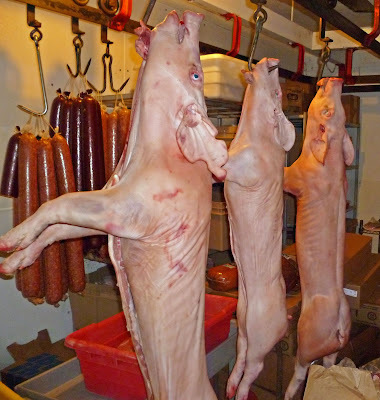 This is achieved by completely drying the surface of the meat. Placing your meat in the refrigerator uncovered overnight will accomplish this. 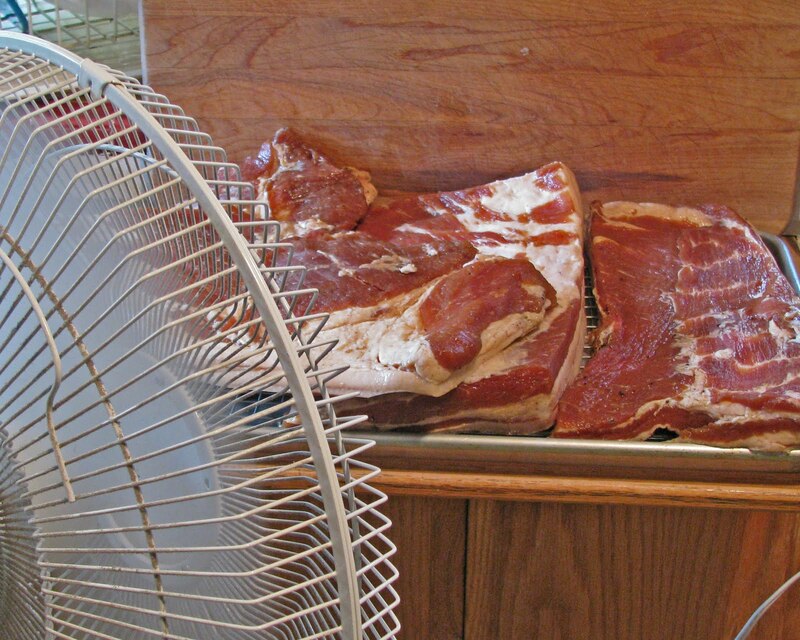 If you are pressed for time a fan will speed up the process. Once the pork was ready it was time to fire up the smoker. 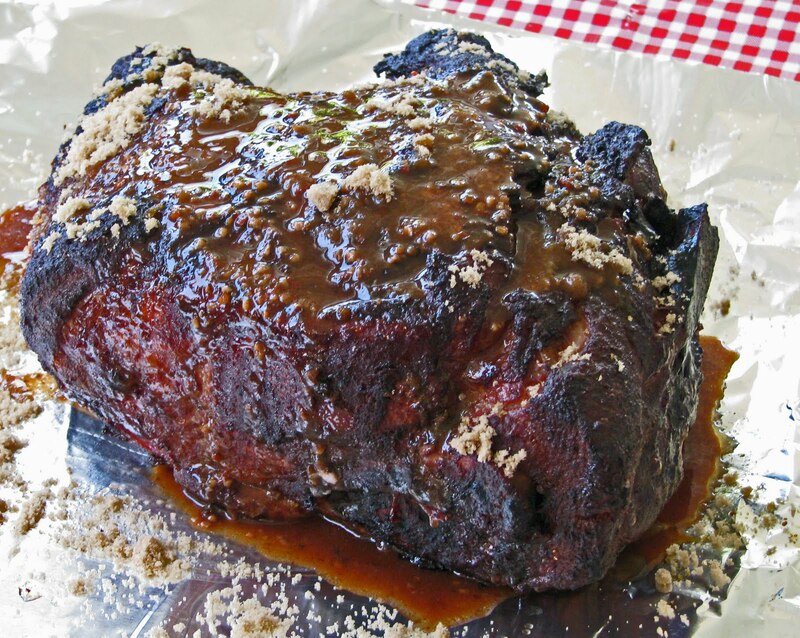 The meat was smoked for several hours with hickory wood. My special French talking thermometer spoke something to me which I assumed meant the slab had reached 150 degrees. (I must learn to speak French.) The bacon was rested and cooled completely. 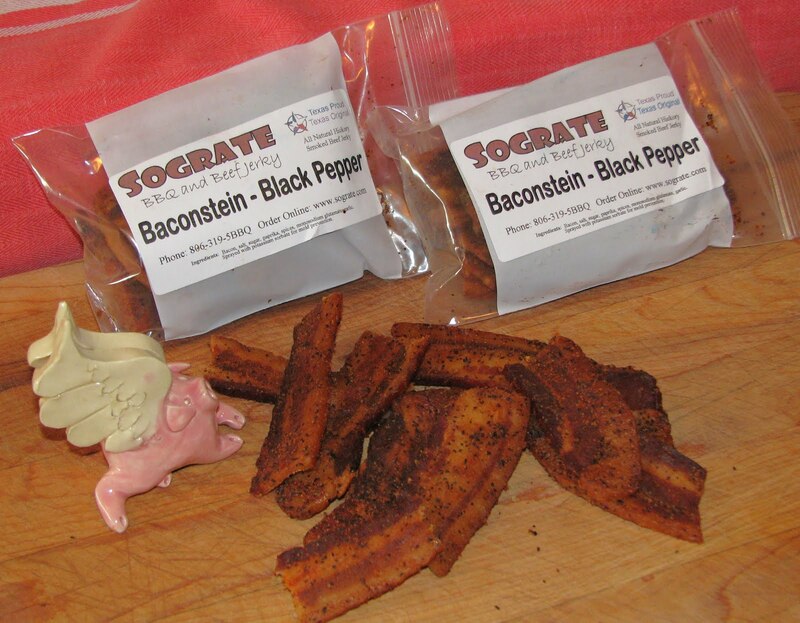 It is time to take our bacon on a test taste run. This bacon smells like a beautiful hickory smoked ham. If this smell was a perfume, I would buy it. The maiden tasting voyage will take place in our trusty, reliable cast iron skillet. This is the perfect bacon cooking utensil. The first thing I noticed was the bacon started to brown a little to fast. I needed to turn down the fire because of the high sugar content in this bacon. The combination of brown sugar, molasses and apple cider really soaked through this batch of bacon. The bacon was cooked to a lovely crisp. “The envelope please”, Sweet with a slight hickory smoke flavors danced on our tongue as we wept with joy. Ms. Goofy liked it because it was not too smoky. The molasses flavor is prevalent with its dark honey like flavor. The salt component was present but not overpowering. 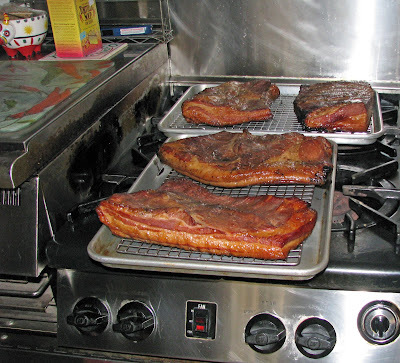 Overall, this recipe produced sweet, smoky, great tasting bacon. It is worth the time and effort to create your own. You can adjust the sugar, salt and smoke to your own preference. You just need to do it! 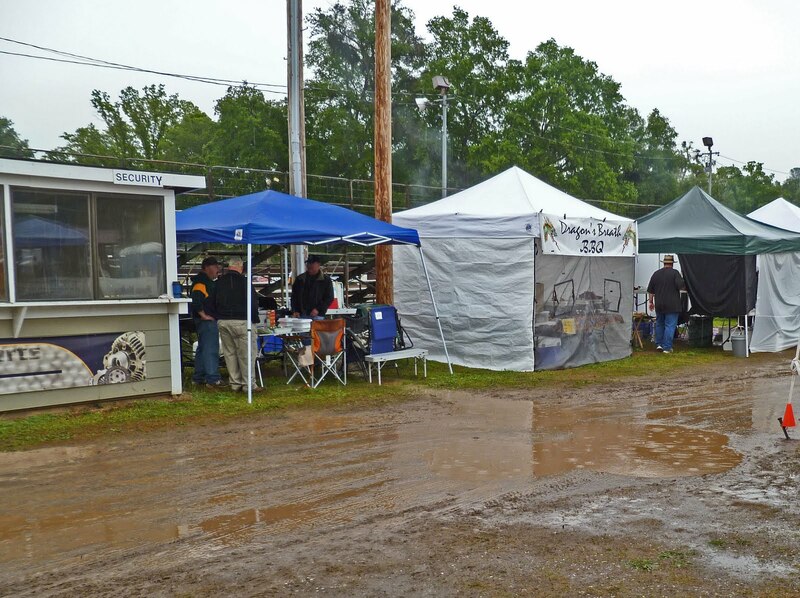 The 3rd Annual Smokin In The Oaks BBQ Championship could have been called 'The 3rd Annual Rainin In The Oaks Championship. Mother Nature never did let up on her down pour of rain. 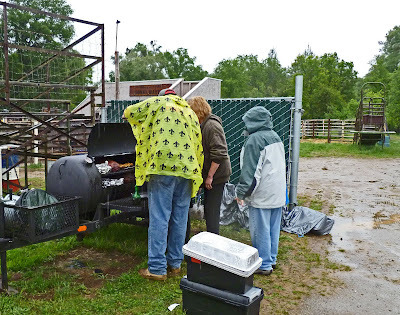 This did not stop twenty five brave and damp barbeque competition teams from cooking some great barbeque. 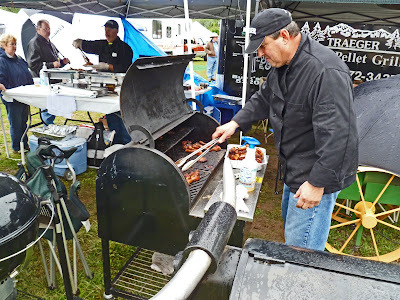 Most teams were prepared with tents, canopy's, umbrellas and covers for their cooking area. The onslaught of rain did not dampen the competitive spirit. 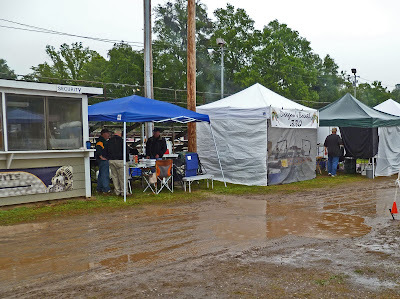 The judging tent was damp but dry. We huddled for warmth until the entries arrived. Once we began to taste the championship Q our spirits and bodies radiated with warmth. A couple of bites and the sun shined if only in our minds. The public did show up but in little numbers and it was understandable. The ones that did were treated to some delicious barbeque. The Peoples Choice awards must and did go on. Congratulations to Harry Soo of 'Slap Yo Daddy' for putting another notch in his belt by winning the Grand Champion. Everybody that attended this event was a winner. It just goes to show you that great barbeque will prevail even though Mother Nature did not cooperate. Today we will smoking eleven pounds of pork belly. This will take a couple of hours and a couple of snacks would sure be nice. It just so happens that my order of ‘Socrates’ Baconstein-Black Pepper’ bacon jerky arrived last week. This product just sounds brilliant. Who doesn’t like bacon or jerky? This product advertises savory bacon seasoned with spices and slow smoked over a hickory fire. I think I am in love. Let’s open up a pack and have a snack. Baconstein smells sweet and smoky just like bacon should. I think we should take a gander at the ingredient list just for research; bacon, sugar, paprika, garlic, and then the kicker, monosodium glutamate, and potassium sorbate. (For mold protection). Now MSG is not a bad thing unless you are allergic or over ingest. It is commonly used as a flavor enhancer. Back to the taste of Baconstein and one needs to be careful because it is so addicting. It is a little greasy but isn’t all bacon? Sweet and smoky, a little pepper sting, slightly chewy but not tough as some jerky can be is the verdict. Overall Baconstein is a convenient snack that actually tastes good. Will it replace traditional bacon? I do not think so. 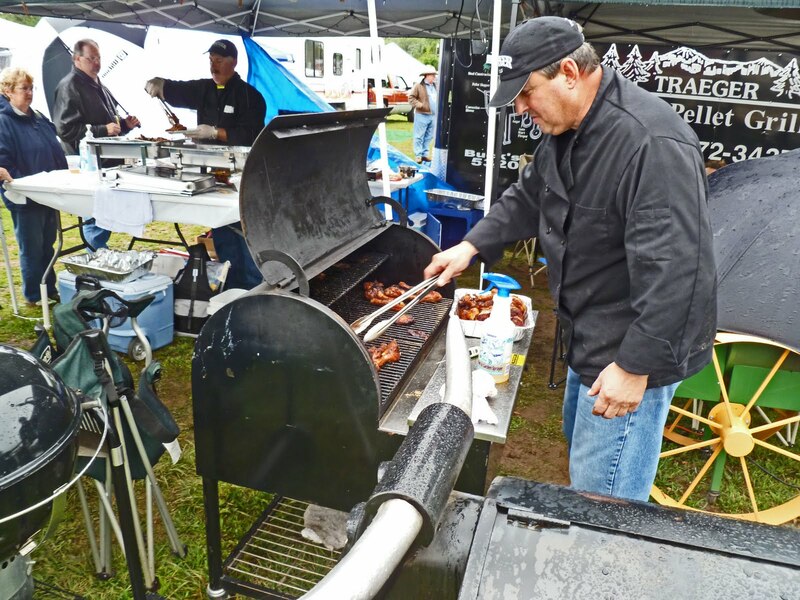 The weekends are all booked up with BBQ competitions. This fun event will be held in Penn Valley California this Saturday and Sunday. It will take place at the scenic fairgrounds. "The Cowboy Mounted Shooting Championship and the World Fast draw Championship" will be held at the Budweiser stage. 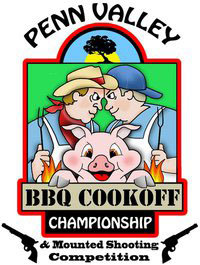 A KCBS state bbq championsip will be held and the public and will be able to participate in the "Peoples Choice' awards. We hope you can stop on by. Here are several pictures from last year. Penn Valley, Ca / Behind the Fire station.